It's no secret that today is Tuesday. Well, every Tuesday, my two preschoolers and I go to a playdate at our local church hall. The young boys there turn up every week in super hero costumes. Their mums say it's their only 'safe place' to play dress-ups without criticism, which is sad really, but that's another post... 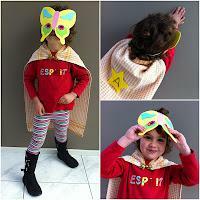 This morning my eldest daughter, Mimi asked why she couldn't be a super hero. "You can," I said, "I'll make you a costume, or better yet; you can make it." Thankfully, she's at an age where mummy-made and home-made things rather than store-bought is still ok. I'm sure it will only be another year or so before anything obviously unbranded will be cringe-worthy, but for now, it's all good. In fact it's better than good. She was thrilled to choose her tea towel, brooch to pin it around her neck, felt star, the letter of the alphabet she wanted me to write on the star (A because it's the first letter of the alphabet and that means it must be fast), and she even helped me (sort-of) sew the star onto the tea towel. She picked out the top, boots, and stripey pants, and though she wasn't thrilled with the butterfly mask (it was apparently a bit too girly for a super hero and we had to search my craft boxes for a 'proper' paper mask (which, incidentally, was pink)), the outfit stayed on the whole 2 hours of playgroup, and she was ever so proud to show it off to Batman, Spiderman and Super-Ben-10-man. Turns out a cape really does make you run faster too when it's time to play catchy-chasey... who knew!